Yesterday, SESEC held its first coalition meeting of 2016. The topic? Admission in Seattle Public Schools. Faauu Manu, Manager of Admissions for Seattle Public Schools, came to speak with us about the admissions process. What criteria is used? Are there better ways to streamline the process? Is there language support for families? What happens with twins/triplets/multiples? These were just a few of the numerous questions that were asked. If you weren’t able to make it to the meeting or simply want to learn more, visit their website here. When: Monday, February 8, 2016 from 7:30 a.m. – 1:30 p.m. Program Details: Food (breakfast and lunch); Red, Black and Green décor; HBCU banners posted around the school; parent caucus and fellowship; youth and community panel discussions; remarks from Seattle superintendent; guest/keynote speakers; food, song and dance; drumming; learning tours and classroom observations; more. The ‘100’ will kick off the day. *They are still looking for 40 men to participate in the 100 Black Men portion. Program Details: MBK initiative and mission is to expand opportunities and improve life outcomes not only for Black males but also for young men and boys of color. 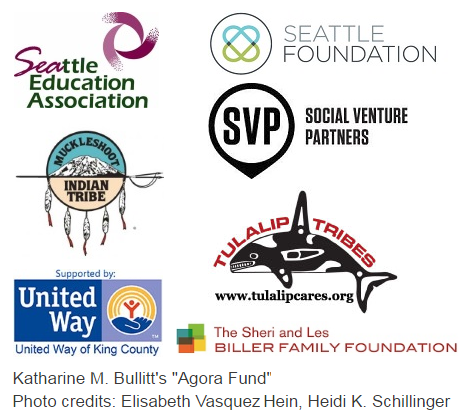 We are hosting this event in partnership with Seattle Public Schools Race and Equity Department, Parents and Family Engagement Department and other partnerships are coming on board. Everyone can play a role in building a brighter future for all children. We believe that as we fashion solutions which help Black children, we fashion solutions which help all children. We want to expand opportunities to break down barrier so our youth can experience greater success. Childcare available. This symposium is free for all. Lunch served at 1.00 p.m.
To RSVP please email [email protected] soon. Challenges with space in Seattle for classrooms been upon us for some time now. Seattle School Board just approved a plan that could push 19 classrooms that are currently being used for preschool and before- and aftercare out to make room for more classrooms. The board has not yet been decided which programs or schools will be impacted. The 2014-15 School Reports are now available on the SPS webpage. The reports show a brief snapshot of a school’s academic growth, student climate, accountability, family and staff engagement, and overall school performance. Check out how your school performed. Washington’s education funding deal may have to wait another year. The state budget director announced this past Thursday that lawmakers will likely not be able to find a new solution by end of the session.